This post was originally intended for my personal blog, but I decided to move it to the company since it’s been a dreadfully long time since I worked on our content. I’m going to make a generalization: Your passwords are very weak and you reuse the same ones everywhere. I would gather >95% of the audience reading this will fit this generalization. Most have their passwords on a notepad in the drawer next to their laptop. Adding numbers and capitals don’t improve your password very much despite what your bank or government site tells you. So, how to fix? 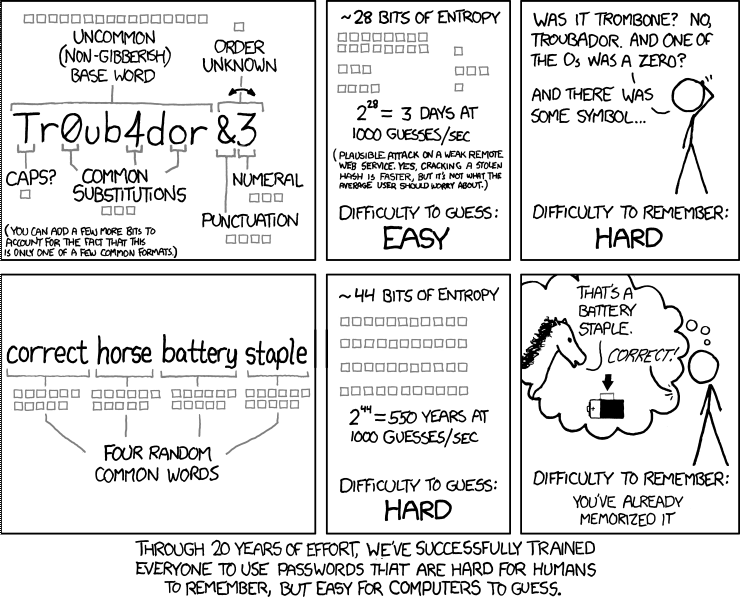 Ideal passwords are constructed using the highest entropy possible. Basically, this means we want something as random as possible. But, we want a random password that is hard for a human and a computer to guess. This doesn’t mean the password should always be difficult to type or remember. You can pick a series of words and a numeric sequence to come up with a very high entropy passphrase that’s quite easy to remember. Continue reading because it will only be important to generate a few good passwords. Proper management will allow you to not need to remember more as software can generate and store the rest. I do recommend high entropy passwords because it makes automated guessing using dictionary lists and common patterns (eg. the password mullet with letters in the front and numbers in the back) impossible. It does not hurt to go overkill if it can still be easier for you to work with. Organizing your passwords is important. Our memory is unreliable. I’ve also worked with multiple small business that need to share lots of passwords. Nearly all of them use some form of easily crackable mnemonic. In my bad password example above, this is the most common form of mnemonic I’ve seen: take property/client name, jam a year on, and some random tail like an exclamation point and call it a day. This will work to sometimes keep out a casual guesser. It’ll also stop reuse, so if one site gets compromised, the attacker won’t login to everything. But it won’t stop anyone who breaks into stuff for a living or some of the more . It’s common and easy to figure out. Attackers are looking for it. Instead, consider using a password manager. Two broad categories are used, offline and online. KeePass is the most well-known offline solution. I recommend an online service for all but the most critical of applications due to the added convenience. Two great online providers are LastPass and 1Password. They are not perfect but they will be substantially safer than password reuse. These services work by giving you an encrypted database of passwords you don’t have to worry about memorizing. Only one strong password needs to be remembered to unlock your secure database of saved random passwords. You want to change your password if it was reused on multiple sites or if the site you used it on was compromised. What usually happens here is that a hacker gains access to a copy of the compromised company’s password database. This database usually does not give them your exact password. Typically the password is run through a function called a hash function and this scrambles the password many times over and stores it in the database as a hash. When you type your password in to login to a site it runs the function and matches it with the hash that was stored. The reason this is done is so that if someone steals your password it will be difficult for the computer to guess the input that produces the same hash. However, if you used a weak password, the computer doesn’t have to guess long and can easily access your account. So by using a strong password like I described above, you buy yourself time to change it and also makes it unlikely that a password cracker is going to spend months trying to break your password. There is a site called Have I been pwned? that will allow you to see if your email address was listed in any site compromises. This is becoming a default feature for banks. Basically, in addition to knowing a password, you need to provide a short number or code from a text message, USB key, or Authenticator app. Text message is not ideal for two factor because it’s not too difficult to convince a phone company to give away your phone number to an attacker. Turning on two factor authentication greatly increases security as even if an attacker has your password they may not be able to login to your account without actually having possession of your phone or keys. Turn it on where available. Google supports it and you can turn it on through the accounts setting page, https://myaccount.google.com/security. We use it inside the company for all critical accounts, and we can turn it on for client WordPress sites by request. Device security is tricky. The advice I give below assumes protection against remote attackers. It does not cover securing against local attackers like a stolen laptop or someone walking into your house/office and installing malware. If you’re very concerned about mobile security, buy an iPhone and keep it up to date. This is the best first-line defense I can recommend. Apple’s software has a track record of not being perfect, but since the iPhone 5S, they’ve used really clever hardware design and do things like encrypting the device by default. They also control their updates and support their devices for years longer than most other manufacturers, (the 5S came out in 2013 and gets current updates). If you must buy an Android device, the Nexus line seems to be the best supported with updates. However, these don’t have the same hardware security features of the iPhone and it’s really difficult to limit privacy tracking. Provided you use a strong PIN and/or fingerprint and have the phone signed into iCloud, there’s not much to be had with a stolen iPhone. I won’t cover MacOS users here because there’s not a sizable percentage and the number of OS threats is lower. For Windows systems, I do recommend Windows 10 despite the bad press and annoying upgrade nag screens. Microsoft has spent a substantial amount of time improving the security of Windows since 7, and the UI on 10 isn’t a nightmare on desktop/laptop like 8/8.1 was. They’re also on their 3rd major revision, called the Creator’s Update, so it’s gotten quite mature. However, it’s not without its flaws. Windows 10 has advertising and sends a massive amount of information back to Microsoft. I use O&O Shutup10 to turn most of it off, Andrew prefers Spybot Anti-Beacon. Whichever tool you use I recommend applying recommended settings, and if you want to apply extra, I do not recommend turning off features like sending virus samples back to Microsoft. We hope you find the information in this post useful. Should you have any questions or feel that we should include something feel free to comment. If you need help developing a more comprehensive security solution for your business, call or visit our contact page.